Miami Beach, FL, October 17, 2017 –(PR.com)– Future Products of Tomorrow LLC, a Florida based company, moves to disrupt the global fashion and wearable technology industry by the design and production of a fashion light-up unisex belt known as Flash-Belt. The fashion light up belt was perfectly designed and developed with the primary aim of revolutionizing the global fashion and wearable technology market through the delivery of the first and only multi-color, multi-mode channel LED fashionable belt. In a bid to achieve their primary aim, Future Products of Tomorrow LLC gathered the best and most talented tech veterans with years of experience in product design, development and manufacturing coupled with the acquisition of state of the art equipments in the technology fashion industry. 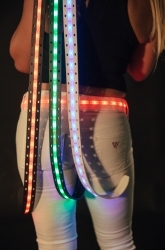 A perfect blend of expertise and advanced fashion technology has resulted in the provision of the most fascinating and innovative unisex LED Flash Belt which lights up the whole area rather than just the body of the user. Flash-Belt was carefully designed with excellent features and cutting edge tech components to offer the best customer experience to its users. To offer users the ultimate style, comfort and self esteem, the unisex LED belt was equipped with multiple color changes, touch operation, and a USB charger. The Flash-Belt which comes in five varying styles and four different colour schemes was made from TPU strong and long lasting materials of international standard and quality sourced from the best and most reliable suppliers in the industry. The user friendly and fashionable belt was also designed to fit all sizes both small and big and is also meant for kid’s fashion, men’s fashion and women’s fashion. To sustain the light in the Flash Belt and keep the vibes going, it was built with a long lasting rechargeable battery that is easily charged using a USB connection cable that is included within the park.